On my 69th birthday, 25 August, 2012, America and Earth lost a hero. This image of his imaginary grave marker for The Merry Cemetery of Săpănța* in Maramureș was sent to me by my good friend Lucian Bogdan of Cluj-Napoca, Romania, who has kindly translated it for me, and for my readers. The Russians: no, it's a hoax! in city slicker clothes: "that's John Wayne!" How I was able to jump as if I were in "Matrix"
It's as dusty as in Bucharest! without touching down on it? whether it's the Russians or us that are lying! Neil, son of the man with a strong arm! 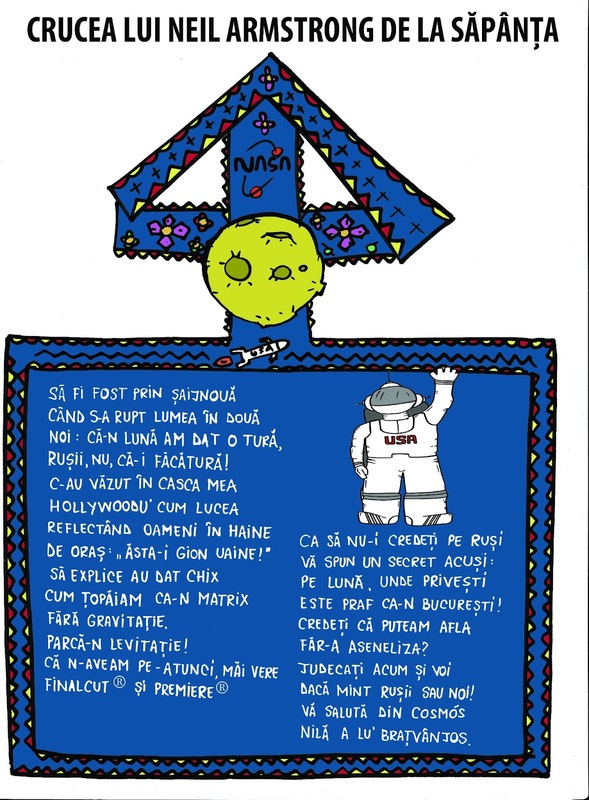 Mulțumesc, draga "comentilor" romăn. Sper ca știu o e-mail adresa pentru tine. Please find me on Facebook, if you want to have a conversation!